The value of pipe #075 is n/a points. Jeff Benner was auctioning a lot of three the pipe, three Venturis, and a Kaywoodie. Since Baker Egerton let me know about this sale and collects Kaywoodies, I gave it to him. 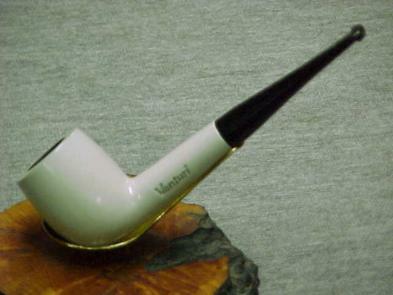 One of the Venturis was a duplicate so I listed it on the Pipes for Sale page. You can check if you want; if I haven't sold it, it could be yours. This was one of those I am happy to keep; it is in better shape than one I had, so the other white billiard Venturi also found it's way to the "for sale" page. And, at last, it is this one's turn to go to the sale block. A still better one has come my way. Allen Moyer took a shine to it and it is his now.